Science fiction legend Sigourney Weaver lends her vocal talents to next month's animated cute-bot movie Wall-E, producers confirmed at New York Comic-Con. Weaver plays the computer for one of robot-building supercorporation Buy'n'Large's spaceships. Producer Jim Morris joked that her new role is a reversal of her iconic moment from Aliens: "Instead of fighting 'mother,' Sigourney becomes 'mother.'" And Morris revealed more about Wall-E's robot buddy M-O (pictured). Eve is sent home and Wall-E hitches a ride on her space ship holding on for dear life to the outside. While in space you get a peek at the new face of Earth. What was once blue is now brown, and green continents are yellow. 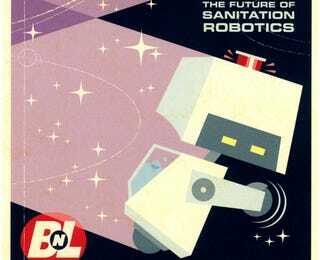 Once inside Eve's home (a BnL ship) Wall-E hides as a steam of worker robots follow a designated path to clean the ship. Grunting his name the new character M-O pops out as the head of the cleaning crew. Much smaller than all the other 'bots, M-O scans each item contamination. His robot scanners can contact even the smallest amount of contamination. Filthy, Wall-E manages to get stuck in M-O's path and M-O deduces that Wall-E is 100% contaminated and in disbelief begins to rapidly clean him. Wall-E, being from a land of garbage, doesn't understand this new robot's obsessive-compulsive need to clean and begins to wipe his feet and watch as the exasperated M-O cleans up his mess again and again. Eventually Wall-E takes off, leaving a trail of mud. Twitching with anger M-O cautiously jumps out of his line, and braces for imminent punishment, but nothing happens and he is free to follow Wall-E, cleaning up after his mess.